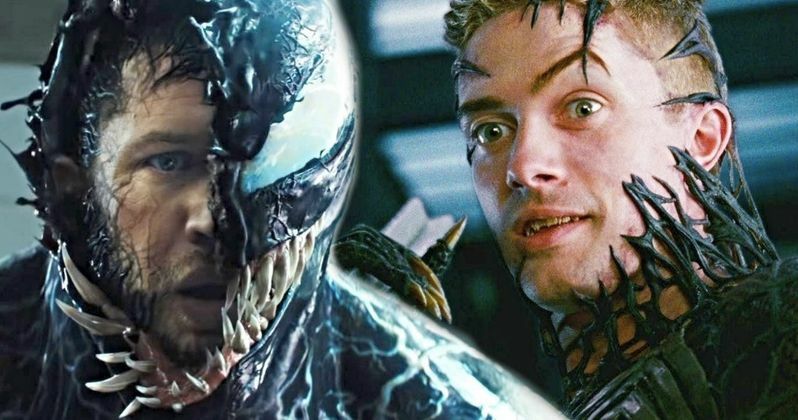 Topher Grace's version of Eddie Brock in Sam Raimi's Spider-Man 3 wasn't exactly what comic book fans were looking for and many considered the film to be a major letdown. Raimi has admitted that he didn't have complete creative control while working on Spider-Man 3, which led to the failure of the movie at the box office. Now, Sony is preparing to launch the standalone Venom film and Grace says that he's "really excited to see" what Tom Hardy is able to do with the character. Sony's Venom is going to be the first time that the character has been on the big screen since Spider-Man 3 when Topher Grace was Eddie Brock and the symbiote. While Grace's version of the character gets a bad rap, he's still a major fan and says that Tom Hardy is the best actor for the role. Additionally, Grace says that he's "thrilled" to see the new version of Venom as a fan. He explains. "To me, I truly mean this, I think Tom is the guy to play that role. I'm thrilled to watch it as a fan. I really mean that. I think he's just the best dude." Topher Grace also spoke about playing Venom in Spider-Man 3 under the direction of Sam Raimi. The actor was a fan of the character in the comics and notes that Raimi's dark version was pretty different from the source material. He enjoyed what Raimi brought to the table, but says that he's "really excited" to see what Tom Hardy did with the comic book version of Venom. He had this to say about the two movies. "I understand Sam's interpretation, which was to do a dark version of Tobey (Maguire)'s character. I was thrilled because I was such a fan of the character, but I was aware of how it was different from what I had grown up reading. I thought it was cool, but I'm really excited to see (Tom Hardy's version). That's the character I grew up with." Venom has a lot of hype behind it now after the latest trailer was released last week and Topher Grace is just as excited about the new version of Eddie Brock as everybody else is. At the time of Spider-Man 3, there were talks of a potential Venom spin-off movie, but that never materialized due to the failure of the third Spider-Man film. Eleven years later, and Tom Hardy is bringing Venom to life again on the big screen. Venom hits theaters on October 5th and Topher Grace will definitely be checking it out, which might make director Ruben Fleischer a bit nervous. If Grace decides that he doesn't like the edit of the film, he's just going to go home and make his own, just like he has done with the Star Wars prequels and most recently with Peter Jackson's Hobbit trilogy. You can read the rest of the interview with Grace and his thoughts on Venom over at Inverse.